I also tried dry embossing. I purchased tools for this at a stamp show I went to with Robin-the-Artist once. Again, I have a lot to learn. Essentially, with dry embossing, you "carve" the paper using templates and a light box. Then the embossed image can be inked to make it stand out more, or it can stay plain to be more subtle. Tonight, Nancy-the-Insightful is headed with me to Robin's house for a "play" date. 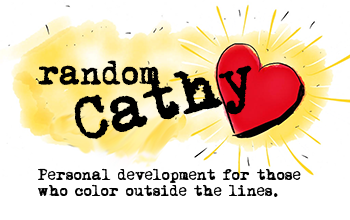 Robin will pull out all of her cardstock, ephemera, and inks and we will eat Thai food, drink tea and create. Hopefully it will be more satisfying than my work earlier today. Update: Tonight, Robin, Nancy and I had the best time. I took a Club Stamp kit that I had never opened (Ivory Elegance 12.06)and played with all of Robin's wonderful inks. I love working on Kromekoat paper. The coated surface really makes the color of the inks "pop." 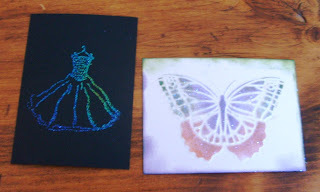 I made several greeting cards, and a set of 4 artist trading cards which redeemed my earlier failed attempts at embossing. In addition to Thai food, wine, conversation and music (Dirt Poor Robins...yeah!) I got to see the baby's room. It is interesting how Robin is using her usual artistic style (stack of old suitcases, antique armoire, etc.) to create a room for the new baby that suits their family. Only eighteen days until she and Floyd get to meet Elliot. Exciting stuff! BTW I love Thai food.